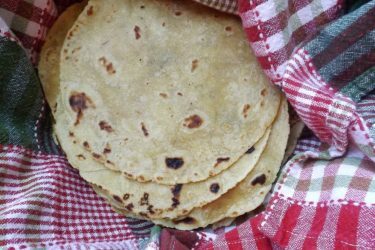 The best recipe for homemade Mexican corn tortillas - simple, easy and delicious. Mexican abuela approved! Nothing will ever replace my favorite dish - pinto beans, chorizo and cheese wrapped in warm Mexican corn tortillas right off the comal (Mexican griddle). 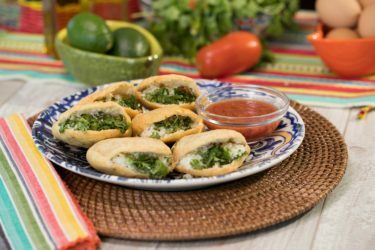 If you ask any seasoned home cook in Mexico for the best tortilla recipe, there will be no real measurements, but lucky for you, I'm sharing my secret doses and ingredients to help you make the most delicious ones in your home. 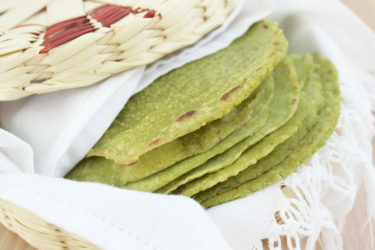 Corn tortilla recipes online or in cookbooks often list three ingredients: masa harina, water and salt. Here, I disclose a fourth one that the official tortilla authority, Mexican abuelas, swear by: two tablespoons of pork lard. The lard is optional; if you'd rather leave this ingredient out, then do so without any other variation. However, I recommend you keep it to make your tortillas softer; they'll even stay tasty once reheated. You can buy masa harina at Mexican grocery stores or in the ethnic food aisle of large supermarkets. Warning: you're about to become a tortilla snob. In a large bowl, mix the masa harina corn flour, salt and hot water until smooth. Add the lard and keep mixing with your hands until the dough is no longer sticking to your fingers. If the dough feels dry, add teaspoons of water to it, one by one, until the texture resembles cookie dough. Once the dough is ready, cover with a dry towel and refrigerate for 10 minutes. Take the dough out of the fridge and divide into 18 equal ball-shaped portions. Flatten each ball between two sheets of plastic, or a resealable plastic bag, using a tortilla press or a rolling pin until you get a round disc not thicker than a quarter of an inch. If you're using a rolling pin and want to get a perfectly round tortilla, I recommend you place a bowl over the flattened ball to make the perfect circle. Peel the tortilla off the plastic and heat a skillet or flat cast iron griddle over medium-high heat. If a drop of water sizzles immediately, the skillet is ready. Cook each tortilla for 1 to 2 minutes on each side, or until puffed. Transfer each tortilla immediately to a tortillero, or basket lined with a kitchen towel, making sure the tortillas are covered so they continue to steam and soften. Serve immediately, or allow to cool down before refrigerating or freezing. Enjoy! You don't have to use a tortilla press, but if you're going to make tortillas often, I suggest you invest in one! To store in the fridge, or freeze, let the tortillas cool down and wrap in a cloth inside a plastic bag. To reheat, allow them to defrost and heat in a skillet, just like when you prepared them.